In the never-ending, broken record saga of blackface as an art form, Dutch model Lara Stone is the latest white person to dip into the shoe polish. 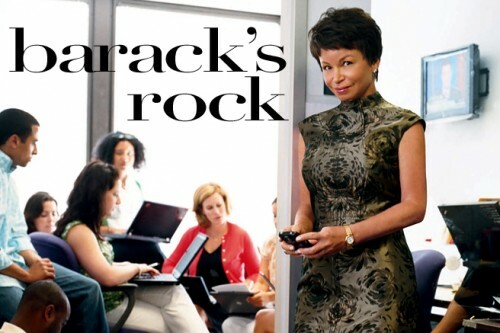 Stone's face, arms and legs were painted in dark make-up to resemble what we can all assume to be a black person. 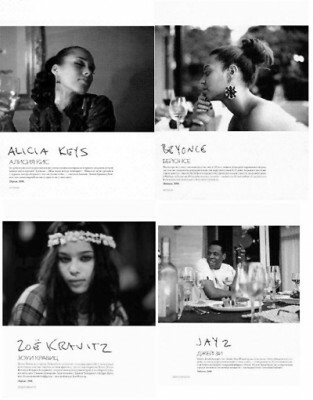 French Vogue's editor-in-chief Carine Roitfield styled the shoot, and is rumored to be next in line as editor-in-chief at the American Vogue. Notorious Vogue editor-in-chief Anna Wintour finally admitted to requesting Oprah to lose weight for her 1998 Vogue cover shoot. Telling the talk show host to drop 20 pounds for her cover, Wintour revealed on 60 Minutes, "It was a very gentle suggestion. I went to Chicago to visit Oprah, and I suggested that it might be an idea that she lose a little bit of weight." 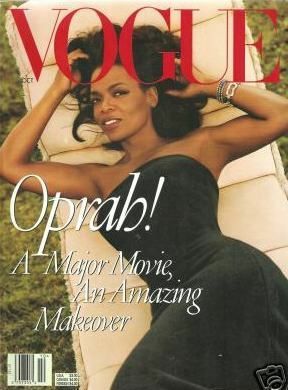 Oprah appeared on the October 1998 cover with the headline: "Oprah! A Major Movie, An Amazing Makeover." 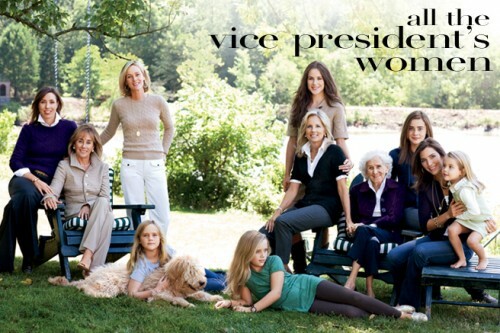 "She was a trooper," Wintour added. "She totally welcomed the idea, and she went on a very stringent diet. 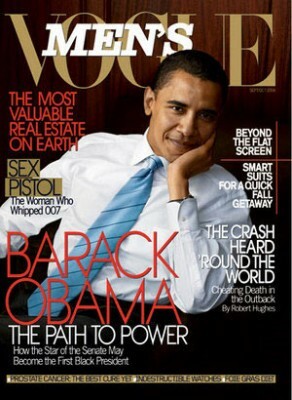 And it was one of our most successful covers ever." 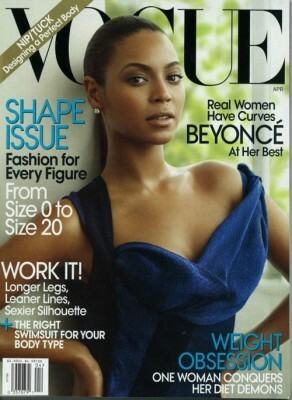 With another influential black beauty (Beyonce Knowles on April 2009 Shape Issue) landing a cover of Vogue, Blindie compiled a list of our favorite Vogue covers featuring phenomenal black women: 1. Oprah Winfrey: Although she famously was told to lose weight for her October 1998 cover of Vogue, the world's first black billionaire was hailed as a burgeoning movie star with her love project, the screen adaptation of Toni Morrison's Beloved. 2. Liya Kebede: The humanitarian supermodel and the first black face of Estee Lauder landed her first and only solo cover of Vogue in May 2005. But the model didn't only model in the issue, she discussed her work on behalf of children around the world, "Cover Model with a Cause!" 3. 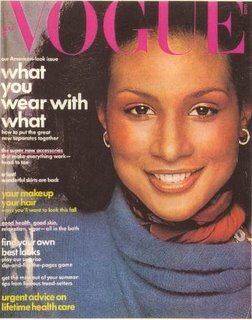 Beverly Johnson: The modeling legend broke the mold in August 1974 when she became the first black woman to land on the cover of Vogue. The magazine dubbed her beauty, "The Today Look." 4. 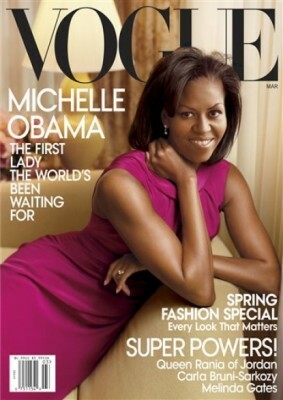 Michelle Obama: Vogue dubbed the effortlessly fit and fashionable Michelle O. 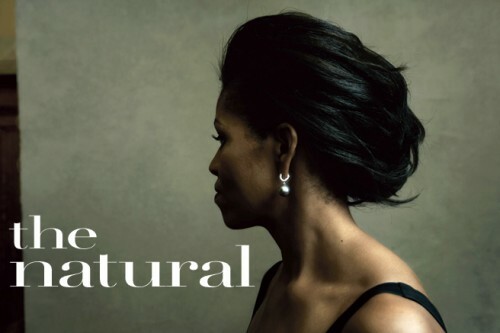 "The First Lady the World's Been Waiting For" on their March 2009 cover--and we couldn't agree anymore! 5. Jennifer Hudson: On the eve of her Oscar win, the Dreamgirls star and American Idol reject took her curves to Vogue's Power Issue in March 2007. "To embrace Jennifer's success and give her a cover that is absolutely historical and unique in the 115-year history of Vogue Magazine," Editor-at-Large Andre Leon Talley said.